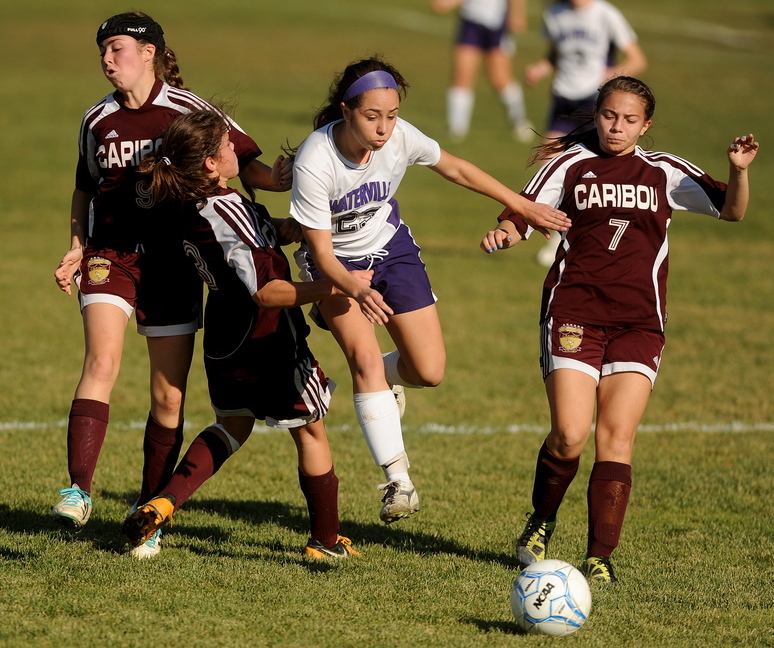 WATERVILLE — The Waterville Senior High School girls soccer team has a saying. Zero-zero, a reminder to play each minute of each game as if it’s a scoreless tie. On Saturday afternoon at Webber Field, the Purple Panthers continuously reminded each other, zero-zero, even as they pulled farther and farther away from Caribou. The Panthers scored three goals in each half and dominated posession, taking a 6-0 win in the Eastern Class B semifinals. 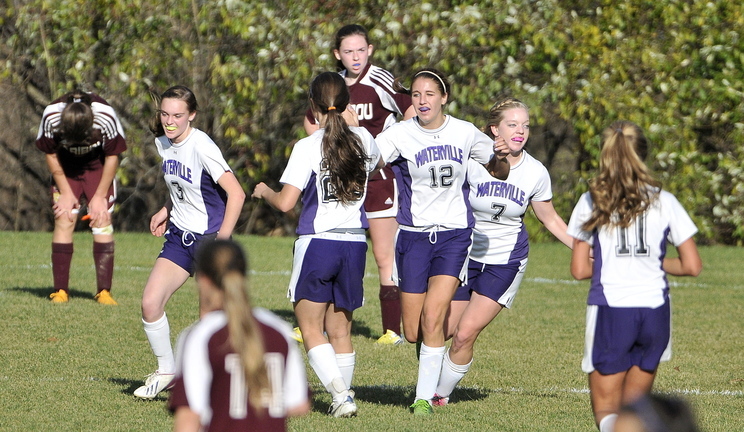 Top-seeded Waterville, now 15-1-0, will host either Hermon or Mt. Desert Island in the Eastern B final on Wednesday at 2 p.m. No. 5 Caribou ends the season at 12-5-0. The Panthers kept pressure on the Vikings’ net right from the start of the game, and broke through for the day’s first goal with just over 24 minutes left in the first half. Lydia Roy took a nice pass from Sarah Shoulta in the right corner and tapped the ball past Caribou keeper Morgan Outing. “It pumped up the intensity. We all knew once we had one goal, we could get another. So we just kept going hard,” said Roy, who scored three goals. Pilar Elias scored on a high shot from the center of the box with 9:50 left in the first half to give Waterville a 2-0 lead. With 53 seconds left in the half, Roy scored again when the ball got away from Outing. Elias made it 4-0 with a penalty shot at 27:13 of the second half. Roy scored on a breakway with 17:07 to play. Brooke Ettinger capped the Panthers’ scoring with a goal 32 seconds later. “We know that we’re wearing the other team down, because you have to chase and chase and chase when you’re always playing defense,” Wilson said. 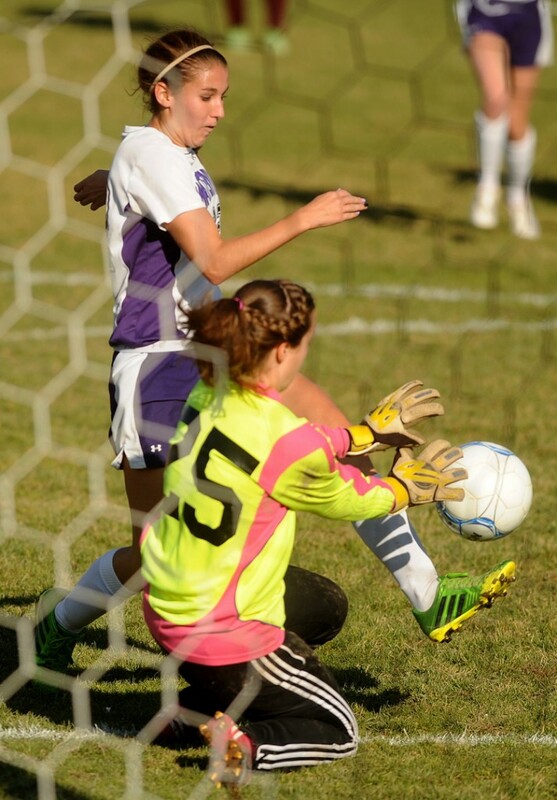 The Vikings never sustained any pressure in the Waterville zone, and goalie Fotini Shanos needed to make just one save before giving way to Gabrielle Martin with seven minutes to play. Outing and Kerrigan Manter combined for 12 saves for Caribou.